Expo Markers makes brilliant fluorescent ink that really gets you noticed. 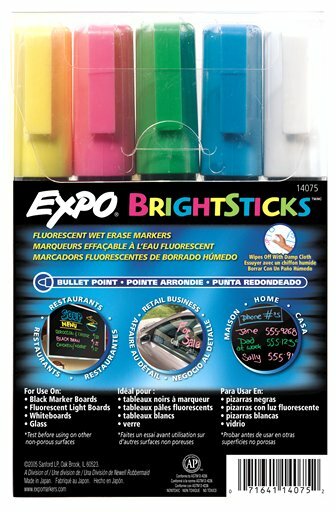 When you mark with Expo Bright Sticks, you’ll be able to provide clear, bright images on non-porous surfaces. They really stand out against black markers boards, fluorescent light boards, or glass. The ink even looks neon under fluorescent or ultraviolet lights. Furthermore, they have a bullet tip that allows you to write clearly without bleed or blurred lines. Another great benefit of these certified AP nontoxic markers is that they are wet erase markers. These selections remove easily with a damp cloth and the snap-cap that prevents them from drying out.